The British economy is becoming more dependent on the state. 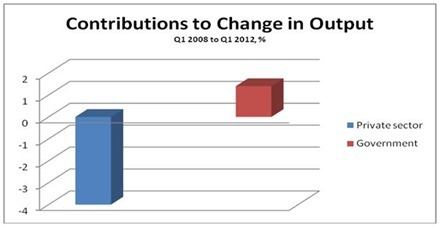 This is revealed in the latest preliminary data for GDP in the 1st quarter of 2013. The preliminary data for GDP only provide limited information – it has only a slim table of data in the preliminary release compared to 40 pages of data in the final release. The data is confined to measures of output from the different sectors of the economy. Even so the preliminary release is very revealing. 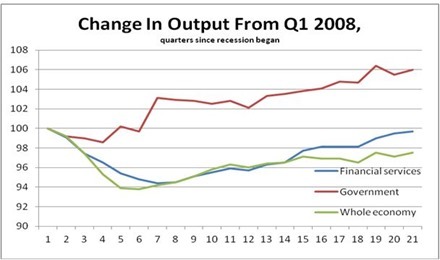 Taking the starting-point of the recession in the 1st quarter of 2008, only one sector has increased its output. This is the output of government services. It has contributed 1.4% to GDP growth over that period. The whole economy is still 2.6% below its peak level prior to the recession. Over that time the private sector as a whole has subtracted 4% from GDP. The contributions to GDP growth are shown in Figure 1 below. The preliminary data itemise ten separate sectors of output. Construction has fallen by nearly 19% in the recession. Manufacturing, which comprises little more than 10% of all output, has fallen by just under 10%. By contrast the sole area of private sector activity which has almost fully recovered is business services and finance. This sector is now just 0.3% below its pre-recession peak. This is shown in Figure 2 below. The revival in the business and finance sector has only been possible because of the enormous subsidies to it provided by the state. In the most recent public finances data (which is also to the 1st quarter of 2013) the total cost to the public sector of bailing out the banks has been £1,020bn. Yet the net return on this subsidy to the private sector has been negative as the banking sector is still smaller than it was before recession. It is arguable that without the state’s support the banking sector would have collapsed entirely. But even on the most favourable comparison from the low-point of the recession the subsidy has been hugely inefficient. A £1,020bn hand-out to the banks has yielded an increase in output over that time of approximately £40bn. It would have been far more efficient if the state had directed its own capital into the production of banking services, via fully nationalised and controlled banks. This same logic applies to all current government schemes to subsidise the private sector, and any that Labour might be considering. Currently, it is estimated that the government has already provided £43.5bn in various subsidies including the National Infrastructure Plan, the Equity Loan and Help to Buy schemes, the Enterprise Finance Guarantee and the Regional Growth Fund, with nothing to show for it. Far greater sums are in the pipeline, up to £310bn. The state is generally a far more efficient provider of very large-scale goods and services. But it is not necessary to accept that idea to recognise the fact the currently the private sector is a drain on the finances of the state. State subsidies to the private sector are not working because the private sector’s investment decisions are determined by prospective profits. If profits are not recovering, neither will private investment. As the latest GDP data shows, currently only the state can lead a recovery. This entry was posted in Economics, Labour Party, Media, Politics. Bookmark the permalink.